I am in love...with a sandwich. It's a very simple sandwich, but it rocks my world. Bagette + goat cheese + ham + fig jam = absolute perfection. I have not had an easy time finding said fig jam in the grocery store, so I was so excited to see fresh figs at the farm this weekend! I made a tiny batch to start and I cannot wait for fig season to be in full swing over the next few weeks so I can stock up. 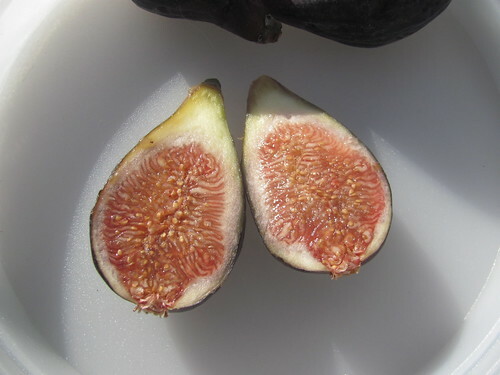 Figs are a little fruit that I have not had the good fortune to be able to experience much in my life and now that I have found them, I don't ever want to live without them. They are also just so beautiful. The color inside is so perfect. You may want to peel your figs for astetics, but I think that is far more fuss than it's worth. Throw your figs into a large pot and mash up a bit with a potato masher. Add your pectin (mixed with 1/2 cup sugar) and bring them to a hard boil (one that cannot be stirred away). Once you are at a good boil, whisk in the rest of the sugar. You can add an extra cup of sugar if you want a sweeter jam - this recipe is really for a more subtle and less sweet blend that I can use in savory things. Bring back to a boil and let boil for one solid minute. Remove from heat. Check for jell with that handy spoon trick I told you about yesterday. Once you have the right consistency, fill up your jars and give them a good 10 minute process in the hot water bath. Start making yourself some delicious sandwiches or serve with cheese and crackers at your next party! I failed so much at jam making last year. I have peach jam in my closet that I am afraid to eat. I just don't trust that I did it properly.